(15January 2012) This issue wll rerun the knockdown recovery essay. The 1 February issue will continue the topic. Stan Kawolski takes his great new AF4Breve on its first flight. The capsize with two men on the cuddy deck is no surprise. The boat was not designed for that. 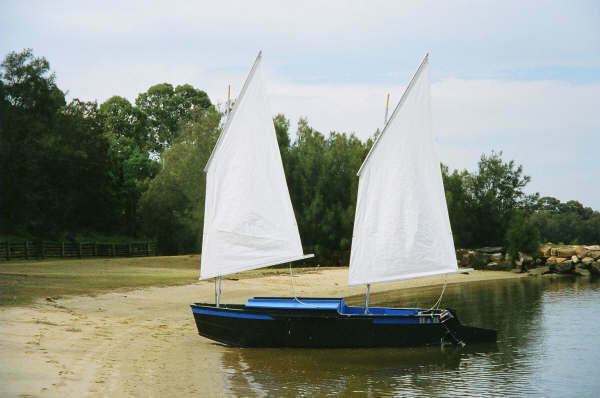 In fact the idea behind the slot top cabin is to do all sail handling from inside the slot. You can do that if the snotter attachment is kept within reach of a person with his feet on the boat's bottom. I suspect the high snotter attachment Herb is using is to gain more sail efficiciency. That is true enough but after having snotter tackles fail in one way or another I learned to keep the them well within reach. Darcy Bryn is the new name of the "Billsboat" project that was discussed here a while back (see the November 2009 back issues). 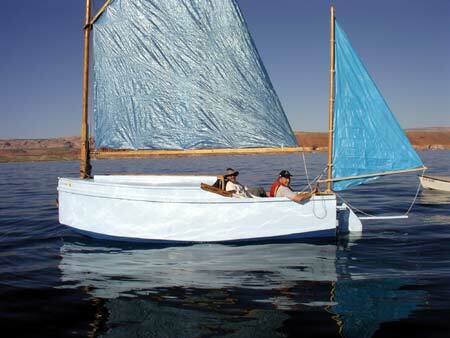 The idea was for a solo cruiser with good rough water capabilities. The issue of self righting was explored rather deeply back then. 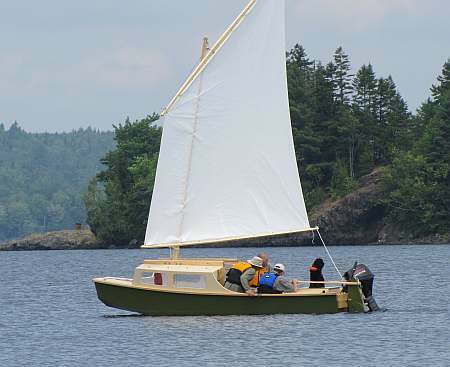 The trouble centers around the fact that a small boat like this can need ballast similar to a larger boat because the critical weight that needs to be counteracted can be that of the crew, and that doesn't scale down with the boat. The number you see all the time for ballast in a small cabin boat is 500 pounds. 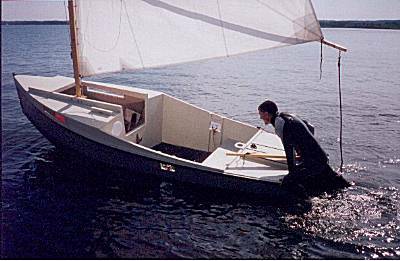 Then for a small boat the problem becomes getting enough buoyancy in a short hull to just deal with the weight of it all, etc. 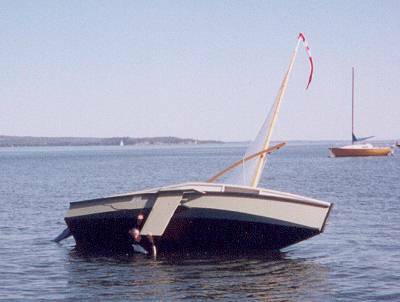 You usually end up with a boat that sits quite deep in the water both to get the ballast down low and to get the hull volume required to float the ballast. 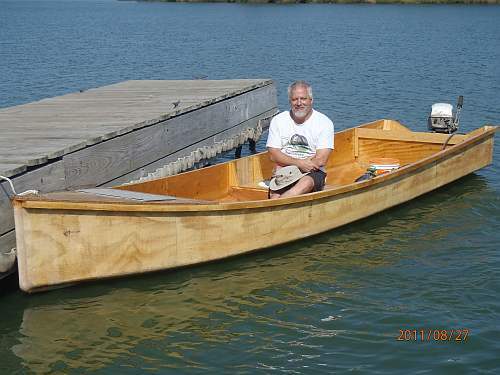 And after you've used a boat that floats in 3" of water you will have little interest in one that grounds out in 18" of water and that is about how it goes. Darcy Bryn is a compromise here because the builder didn't really want the above solution. So what you have on the drawing is 200 pounds of lead bolted to the bottom of the hull, enough we figured to right the boat from a knockdown as long as the crew has jumped in the water and thus removed his weight from the capsize equation. 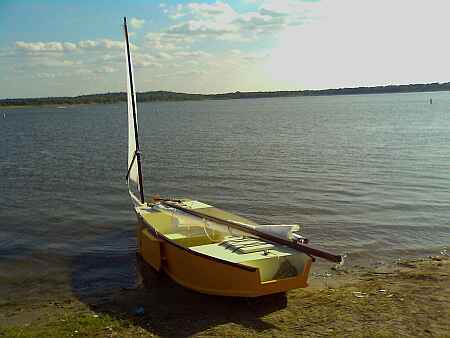 Then the boat will right on its own and should be free from swamping of any sort since she is decked over all the way. Then the skipper needs to get back up and in somehow. 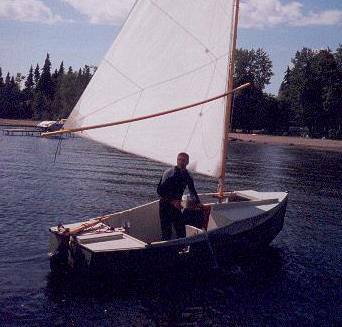 Not always easy and you must be prepared for this both with a ladder of some sort that you can grab while swimming, and also with the sail's sheets released so the boat won't sail away without you, which many rigs like this yawl rig can and will do. If it sounds too risky then you might add another 300 pounds of lead and hopefully it will self right with you still on the deck. If this all sounds pretty wild I can tell you I know of two Bolger box cruisers that behaved exactly this way in real knockdowns. 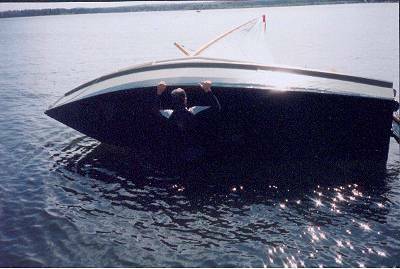 Boat tipped and was stable on its side, crew jumped in the water, boat righted and crew reboarded. I think Darcy draws about 12" of water at full weight partly because the ballast extends about 3" below the bottom. 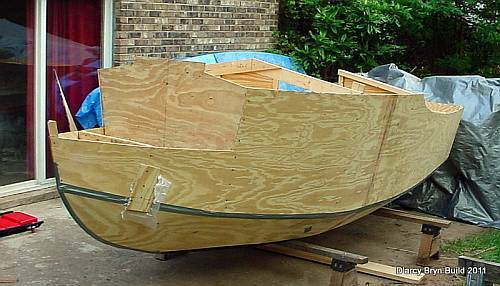 To make the hull take rough water I shaped it with multichines and a pointy bow. It is pretty curvy. The multichines reduce the internal volume and the pointy bow pushed the effective cabin back to the point where a long floor sleep space is acquired by having the sleeper's feet extend past the main bulkhead and under the aft deck. But even with the pointy bow she may not be too comfortable sleeping anchored in open water. 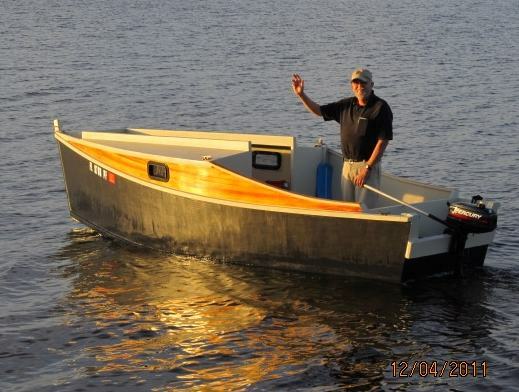 The rig comes right off a Mikesboat because Bill already has a Mikesboat. 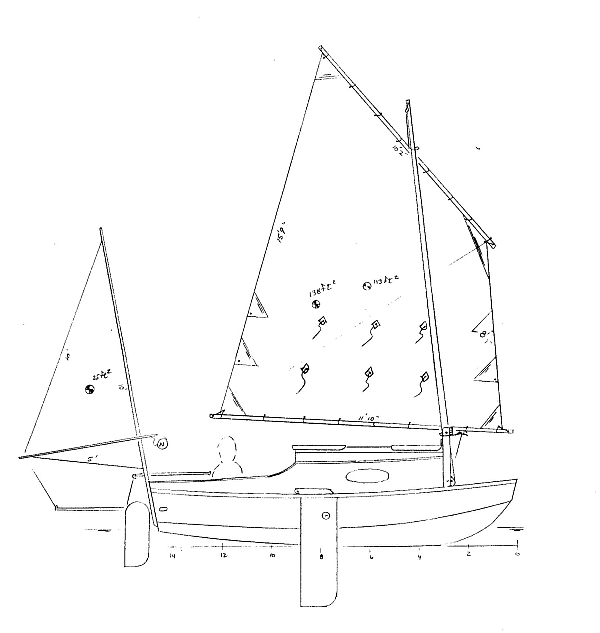 It looks a bit large on the drawing but lug sails can reef nicely and quickly with practice. 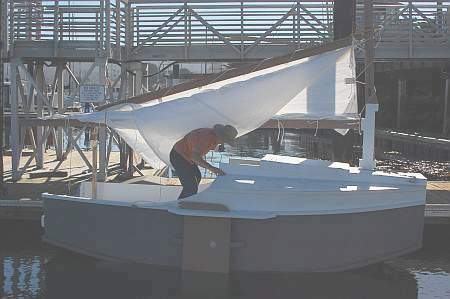 The mast is mounted on a tabernacle but whether it is safe to swing the mast up while afloat is a good question, at least I don't think it can be done safely by standing on the deck. Maybe by standing in the front hatch with your feet on the floor. Best done with the boat on the trailer or beached, I'd say. Well, I guess I've given you all the negative warnings. 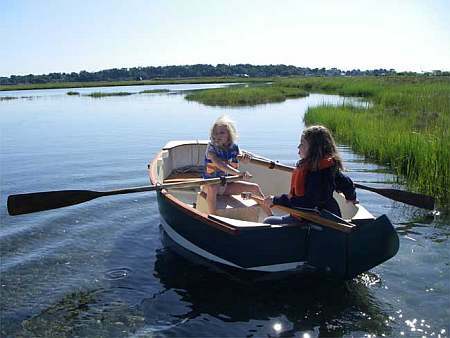 In the end it might be a tough little boat capable of staying out in the rough stuff after everyone else has given up. With a cozy cabin. Prototype plans for DarcyBryn are $35.